linen, cotton, metal zipper, machine sewing. 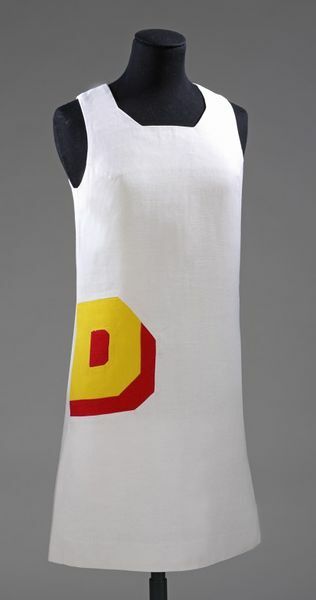 Marit Allen wore this graphic white linen mini-dress in 1966. It is called 'Double D' after the bold yellow and red D-shaped pocket at the side of the otherwise perfectly plain white shift. The designers, Marion Foale and Sally Tuffin, also did versions using other letters of the alphabet. They were known for their lively, wearable designs intended for active young women to wear in a wide range of circumstances. Marit Allen (1941-2007) was a leading British fashion journalist who started as an assistant at Queen magazine in 1961. In 1964, she joined British Vogue, where she stayed for ten years. Her 'Young Idea' pages were hugely influential. In June 1966 she published a photograph of a 'Double D' dress in a 'Young Idea' fashion spread based on a Batman comic strip. Many young and innovative designers, such as John Bates and Foale & Tuffin, received significant exposure through Allen, who not only gave them magazine coverage, but happily wore their clothes herself. 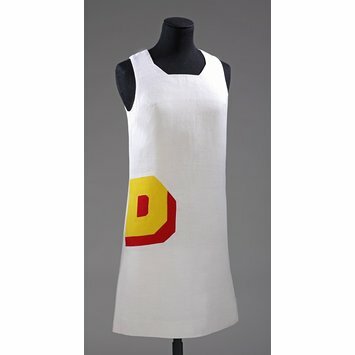 Sleeveless white linen shift dress with square neckline mitred at the corners and graphic inset yellow and red linen 'D' shaped pocket at wearer's left hip. Apart from a partial cotton lining to support the neckline and armholes, the dress is unlined and fastens down the back with a metal zipper. This dress was worn by the fashion journalist Marit Allen (1941-2007). A version of the dress was modelled and published in a comic-strip themed double-page spread in British Vogue, June 1966. In addition to being available from Foale and Tuffin's boutique, it was advertised as being available from the Countdown boutique on King's Road for 9 guineas. Marit Allen entered fashion journalism in 1961 when she became an assistant at Queen magazine. She quickly gained control of the "About 20" pages of the magazine, in which she showcased young design talent and innovative photography. When Beatrix Miller, the editor of Queen, went to edit Vogue in 1964, she took Marit with her. For ten years, Marit Allen worked as a fashion editor on the magazine. Her "Young Idea" pages, written and captioned by herself, showcased innovative young design and fashion, and had a great influence on 60s fashion. Marit Allen was often photographed for her own stories. 'Double D' minidress by Foale & Tuffin, London, early 1966. Linen.